President Donald Trump and his White House team have been cleared of collusion with the Kremlin in the 2016 presidential election. That startling conclusion by Special Counsel Robert Mueller after nearly two years of investigation, might be viewed by some as giving Trump freedom to now get on with normalizing relations with Moscow. Don’t bet on it. Mueller’s report, and US attorney general William Barr’s appraisal of it, only partially vindicate Trump’s long-held claims that the whole so-called “Russiagate" story is a “hoax”. Yes, Mueller and Barr conclude that neither Trump nor his campaign team “conspired” with Russia to win the presidential race. But Democrat opponents are now dredging up the possibility that Trump “unwittingly” facilitated Kremlin cyber operations to damage his 2016 rival for the White House, Hillary Clinton. In his summary of Mueller’s report, Barr unquestioningly accepts as fact the otherwise contentious claim that Russia interfered in the US election. Democrats and the anti-Trump US news media have not been deterred from pursuing their fantasy that the Kremlin allegedly meddled in US democracy. Trump has been cleared, but Russia has certainly not. It very much continues to have the smear of interference slapped all over its image. At the heart of this narrative – bolstered by Mueller and Barr – is the false claim that Russian cyber agents hacked into the Democrat party computer system during 2016 and released emails compromising Clinton to the whistleblower website Wikileaks. That whole claim has been reliably debunked by former NSA technical expert William Binney and other former US intelligence officials who have shown indisputably that the information was not hacked from outside, but rather was released by an insider in the Democrat party, presumably based on indignation over the party’s corruption concerning the stitch-up against Clinton’s rival nomination for the presidential ticket, Bernie Sanders. That is real scandal crying out to be investigated, as well as the Obama administration’s decision to unleash FBI illegal wiretapping and dirty tricks against Trump as being a “Russian stooge”. The Russian collusion charade was always a distraction from the really big serious crimes carried out by the Obama White House, the FBI and the Democrat party. In any case, the notion that Russia interfered in the US elections – even without Trump’s collusion – has become an article of faith among the American political and media establishment. That lie will continue to poison US-Russia relations and be used to justify more economic sanctions being imposed against Moscow. Trump may be cleared of being a “Kremlin stooge”. But he will find no political freedom to pursue a normalization in bilateral relations because of the predictable mantra about Russia interfering in American democracy. But there is a deeper reason why there will be no reset in US-Russia relations. And it has nothing to do with whether Trump is in the White House. The problem is a strategic one, meaning it relates to underlying geopolitical confrontation between America’s desired global hegemony and Russia’s rightful aspiration to be an independent foreign power not beholden to Washington’s dictate. Russia under the leadership of President Vladimir Putin has presented a somewhat shocking quandary for the US ruling class. It found that Russia was no longer in the servile business of rolling over to pander to Washington’s tyranny in international relations. Under Putin, Russia shook off the vassal status that it had unfortunately acquired under the feckless presidency of Boris Yeltsin (1991-99). Putin’s landmark speech in Munich in 2007 was certainly a watershed moment in geopolitical relations whereby the Russian leader condemned US rampaging across the Middle East with criminal wars. Then there was the failed attempt in 2008 by the US and NATO to over-run Georgia, failed because of a decisive military intervention by Russia in support of neighboring South Ossetia. 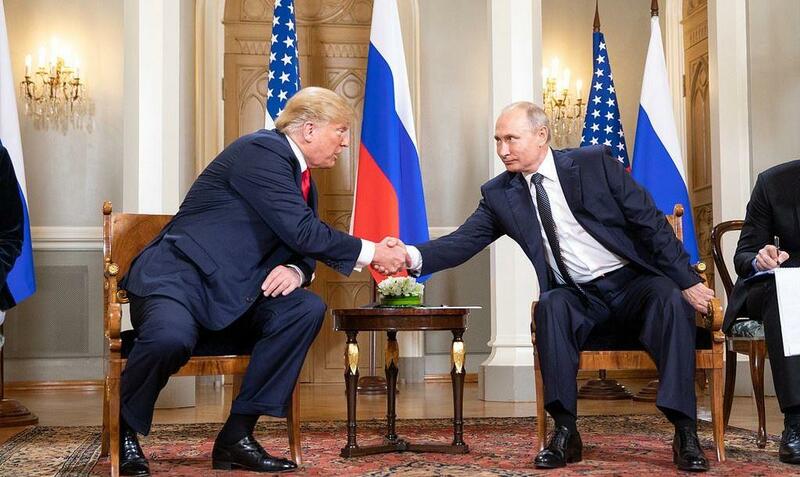 The return of the Cold War in US-Russia relations under former President GW Bush was due to the realization in Washington that Putin and Russia were no longer subordinates that could be pushed around for the gratification of American imperialism. The Americans then tried another tack. Public relations and inveigling. When Barack Obama took over the White House in 2009, there was the famous “reset policy” initiated by Washington towards Moscow. In March 2009, US Secretary of State Hillary Clinton greeted Russian counterpart Sergei Lavrov in Geneva with a jokey “reset button”, purportedly to demonstrate a willingness in Washington for a new beginning in bilateral relations. Ominously, Clinton’s State Department mislabelled the button with the Russian word for “overload” not “reset”. Her inane cackling to ingratiate herself with the skeptical Lavrov was also a giveaway of a phony reset. Look how hollow such ostensible claims for “reset” by Washington have since manifested. Admittedly, there was a significant gain in Obama’s negotiation of substantial nuclear arms reductions with the New START treaty in 2010. However, it didn’t take long until Washington was back to its usual business of subversions and covert wars for regime change against foreign states that didn’t kowtow to its dictates. We saw this with ample evidence in the overthrow of Libya’s government in 2011, the attempted ouster in Syria beginning the same year, and the even more daring American intervention in Ukraine in early 2014 when it installed a rabidly anti-Russian regime through an illegal coup d’état. We are also presently seeing this criminal American imperialism being conducted brazenly towards Venezuela, where Washington wants to overthrow a socialist president in order to get its corporate hands on the South American country’s vast oil wealth. All the while, Russia has become ever more resolute its defiance of Washington’s global gangsterism. Moscow’s military defense of Syria from US-led regime change was certainly a pivotal moment in defining the limits of Moscow’s tolerance, as was Russia’s defense of Crimea. For these reasons, Washington in its chagrin has moved to abandon the other major arms control treaty, the INF, which could allow it to install short and medium-range nuclear missiles in Europe, thus aggravating threats and tensions with Russia. The future of the much-vaunted New START treaty is also in doubt because of American vacillation. So much for Obama’s “reset”. These are the structural, strategic factors in why Washington is set on a course of hostility towards Moscow. It has got very little to do with President Trump being in the White House or whether he has been cleared of “collusion” with Moscow. The fundamental issue for Washington is that Russia is not a vassal for American imperialism. That’s why there will be no reset. There will only be reset when American imperialism is replaced by a law-abiding, genuinely democratic US government. Until then, expect more US hostility, confrontation and even war towards Russia.